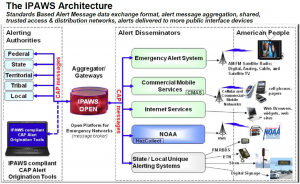 FEMA IPAWS Alert Feed | Gorman Redlich Mfg. Co.
CAP RWT messages will be sent at 11 AM in each of 9 local time zones extending from Guam and CNMI (UTC +10) to American Samoa (UTC -11). There will be one CAP RWT issued per time zone on a whole state basis during the local 11:00 AM hour each Monday. For purposes of these exercises, states divided into more than one time zone are assigned to the time zone that includes the largest area within the state. The basic idea of how the CAP-EAS systems will work from start to finish is as follows below. For more specific details, refer to the OASIS CAP v1.2, IPAWS Profile v1.0 an EAS CAP Implementation Guide specifications as well as information provided on the FEMA website. 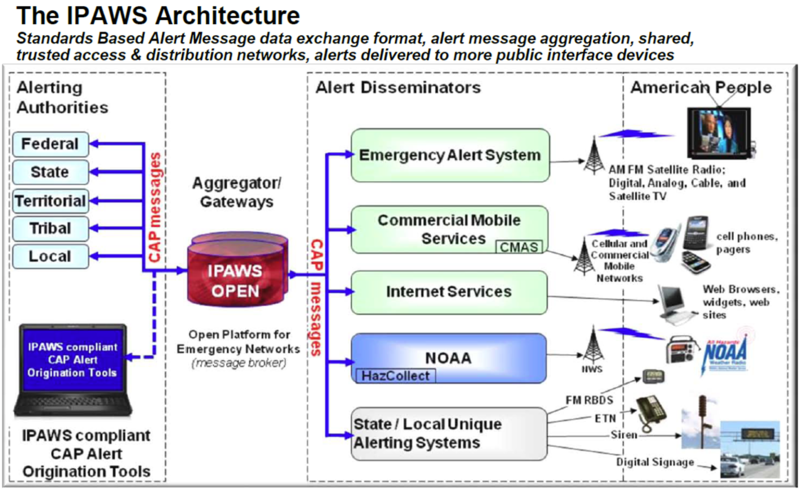 A qualified message originator will create an alert message in CAP format and place it on the alert server (message feed). A CAP-EAS device will check the message feed for new alerts. If new relevant (e.g. in the specified listening area) alerts are present, the device will download and begin processing the alert. If the message meets all requirements (e.g. format requirements, in listening area, not expired, etc. ), the message is converted from CAP format into EAS header format. The converted EAS message is processed in a similar fashion as current over-the-air EAS messages are processed. Will I receive these RWTs? The current version of Gorman-Redlich CAP-DEC1 CAP-to-EAS Decoder equipment is fully compatible with the new FEMA alert message aggregator feed. Units with SN#500 and above are shipped with software compatible with this feed (V2.21 b10.19.11 and above). Units with serial numbers below 500 were not shipped with this software but some units have been updated in the field. If your unit has not been upgraded to be compatible with the FEMA IPAWS alert aggregator feed yet, contact Gorman Redlich with your unit’s serial number for a software update and update instructions. As messages are sent for “Entire State” locations, please ensure that your unit has the correct “Entire State” code added to its listening area list.